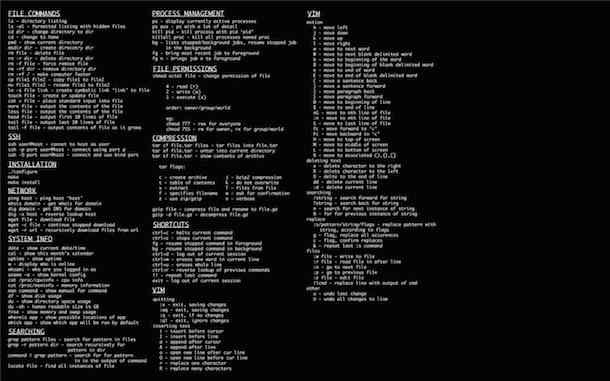 If you’re new to using the command line and trying to learn the Terminal, setting a cheat sheet of command syntax for commonly used tricks as your background picture can be a pretty helpful way to help remember commands. The picture includes: file commands, ssh, installation and building from source (will require dev tools), network basics, system info, searching, process management commands, file permissions, compression, general command line shortcuts, and VIM, and much more. 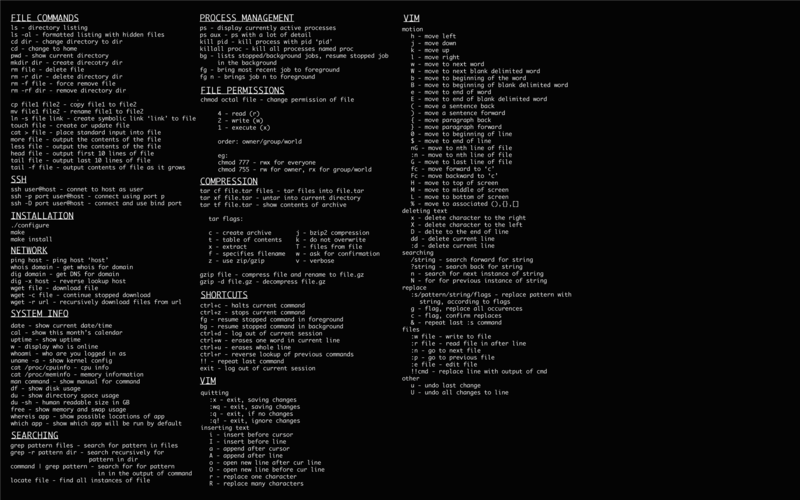 While this cheat sheet background was intended for Linux users, the majority of the commands work in Mac OS X too since Mac OS is based on a unix BSD core, so whether you’re on a Mac or PC doesn’t really matter quite as much as having access to the command line and it’s power. Set the wallpaper to your Mac or Linux machine and you can see the desktop for quick reference for tons of commands that are often used. This is a really handy way to learn neat tricks, particularly for those who are new to the command line or for those who just like to have a refresher handy for some methods and syntax for the myriad of commands available. Thanks to Peter for sending this in, you can also check out more of our command line tips too. Update: as a few commenters pointed out, the originally sourced image contained a joke that was not particularly funny, the picture has been changed. There is no command to ‘make your computer faster’ ! One thing I’ve read about this command-line stuff is how important it is to get things exactly right, because a command that’s mistyped can cause problems. If that’s so, how concerned should we be about a cheat sheet which contains the word “direcotry” (as in “mkdir dir – create direcotry dir”)? Yes typing things correctly is very important. On that note, the original image contained a somewhat common joke in the Linux world regarding the ‘rm’ command that is not helpful to novice command line users. The claim was that it makes your computer faster and this is false, it removes files. The image has been changed, it is a good idea to update to the newer image. “make computer faster” are you sure? make the computer very clean…. The rm ha-ha is exactly why I hate the Linux world, those neckbeards think it’s just so cute to pray on beginner knowledge levels forgetting that they too had to learn at one time. Just because some people do that doesn’t mean everyone does. That’s a blatant accusation it’s also an assumption. Like many assumptions it’s flat out wrong. I have never done that nor will I ever and I’ve been using different Unix derivatives since the mid 1990s. If you specify it in a humour document with a big warning it might be different but I still would be cautious on that. As for me I laughed out loud years ago when I first read it but this is one of those things that in fact I – and I suspect many others – never ‘had to learn’; we just knew it. Incidentally you really should never ever type a command if you don’t know what it is; and to learn you should type it yourself so you learn it in time. It’s incredibly easy to screw up a computer at the command line and there are really nasty things besides file removal. As for rm -rf / some implementations guard that and you specifically have to pass an option to allow it (I have always viewed this as baby sitting and dangerous: it gives you a false sense of security – what happens if you go to a system that doesn’t have that protection? This is an example of a much wider problem; aliasing rm to include the -I (should be lower case but I’m not seeing an option in Safari – not my primary system – to disable the replacement); not all systems have that aliased and I specifically disable it on all my systems (same with cp, for example). Bottom line is this has ABSOLUTELY NOTHING to do with the ‘Linux world’; it has to do with PEOPLE. Please don’t vilify an entire community because some people think it’s funny to hurt other people. Slander/libel isn’t much better is it? No it’s not. You’ll find many helpful people in the Linux community and I am one of those. yes they do, you are probably just doing it wrong. it’s not very apparent in the way this image shows. bg and fg are used after hitting ctrl+z, for example. If you “bg” a command, you will still see the output of the command, but you can input new commands. Try it. I fixed the typo with Gimp on my copy. Not too difficult to carefully cut the misspelled word, fill with black, and then insert a correctly spelled word. I still need to airbrush the new word slightly, but I like it better spelled right. I rethought my Gimp fix for the typo; there is a link for the corrected image. Enjoy! To anyone using this version, remember that the rm -rf command does not make a computer faster, it removes files. Is there a command or option in rm to remove directory even if its not empty? Yes you can force a directory to be deleted by adding the -rf flag to rm, it is very unforgiving though and not recommended unless you’re an advanced user. Once you delete those files, they are gone for good. Ooops, I didn’t mean to use that version for posting. :D Let me make up a new one using the correct version. I have the “joke” one on my desktop just for grins because I know what it really does.